Got an ugly tub or shower? Don't replace it, Reglaze it!! Please review these basics before our visit. We save you money by saving your tub. Our Shower and Tub Reglazing company provides the highest quality service for our customers in Baltimore County, and other surrounding areas. When you Reglaze your bathroom tub, it is long-lasting. The glaze chemically bonds with the surface, in effect creating a new surface. By reglazing, you can get years out of the bathtub or counter tops you thought you had to replace. Rub A Dub Tub does not cut corners. Each tub is primed twice and receives 3 coats of highly durable acrylic polymer with a finish coat. With Rub A Dub Tub Reglazing of Baltimore County, you know how much you are going to pay right from the beginning. There are no removal or installation costs. 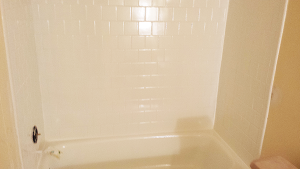 With bathtub refinishing, the actual re-coating and re-glazing process takes only a day. Anything we reglaze will be fully functional in 24 hours after we apply the first coat.You get a 5-year warranty; we are so confident in our work that we will back our work up for 5 years. You don’t have to do a full bathroom remodel. Bathtub refinishing means everything stays where it is—no mess! We can update those out-of-date colors in your bathroom tub, sink, tiles, and counters.